With temperatures hovering around zero and wind chills dropping, at times, to minus 20, over a thousand students gathered in South Dakota from all across the Midwest for a week-long college theatre conference. Fourteen students and two faculty members from MBU Theatre traveled to Sioux Falls, South Dakota, Jan. 20-26, to join students and faculty from colleges across Iowa, Kansas, Minnesota, Missouri, Nebraska, North Dakota and South Dakota for the Region V Kennedy Center American College Theatre Festival. The students spent a week competing for a chance at a national scholarship, auditioning for professional companies and participating in various workshops and intensives, while the faculty hosted workshops and discussion panels, networked with other theatre faculty and guided the students through their auditions and experiences. Andrea Robb, adjunct instructor of theatre and communications and assistant director of In Charactre, said much of the value in going for the faculty is the networking aspect. 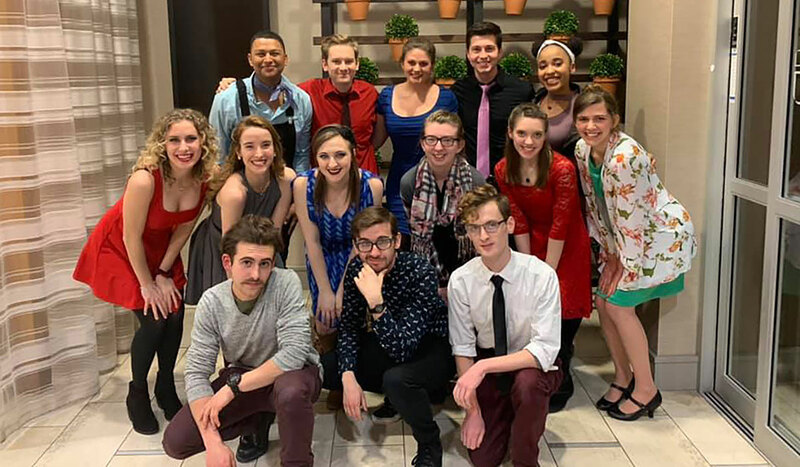 This is the third consecutive year the MBU Theatre Department has participated in the festival and the first year the festival was hosted in Sioux Falls. On Sunday night, Jan. 20, during the opening ceremonies, festival organizers recognized commendable work by participating universities in their 2018 productions. MBU Theatre received five commendations for their shows in 2018. “You’re a Good Man, Charlie Brown” and “The Amish Project” both received commendations for an outstanding ensemble and three individuals received recognition for their work on “MacBeth”: Chandler Spradling (Video Production), Eric Phillips (Sound Design) and Tyler Gruen (Props Mastery). “It’s really nice to know that the education they’re getting here and the talent that is being instilled in them is definitely on par with the rest of the professional world,” Robb said. The scholarship competition involves three rounds of performances in which each nominee and a scene partner of their choosing present different scenes, monologues and/or songs. MBU Theatre students did not advance past the first round. 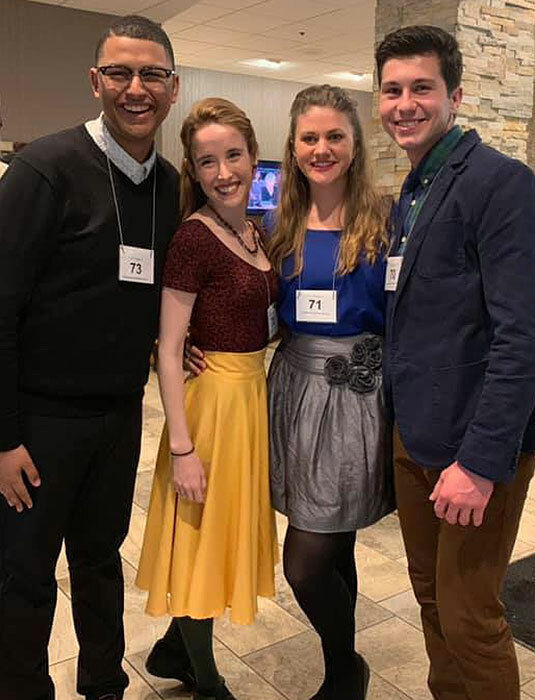 However, five students (Dilworth, Peters, Side, Tyler and Kristianna Pirrie) also participated in auditions for professional theatre companies in the region. Four received callbacks from companies located in places such as New York City, Nebraska, California and South Dakota. Tyler said it was valuable to observe students from other schools audition. “All of us are from different schools and so we only hear and see experiences from our own school; so to see and hear people from different schools and stuff and how they learn to audition was so cool,” Tyler said. Side, a senior mathematics and theatre double-major, received a job offer from one of the professional companies she auditioned for. She emphasized the value in being able to audition for 40 companies at once, especially for graduating people who are looking for work. Participating for three consecutive years has offered Side a variety of opportunities and experiences, including being part of the Invited Scene Showcase, competing for the Irene Ryan Scholarship as a nominee and scene partner and going to workshops, seminars and keynote speakers. In January 2017, MBU Theatre’s, “It’s a Wonderful Life: A Live Radio Show,” was asked to participate in the Invited Scene Showcase. The following January, MBU Theatre’s production of “The Caucasian Chalk Circle” received an invitation — one of six productions asked to perform at the festival to show students in the audience examples of excellent and innovative approaches to live theatre. Peters, a sophomore theatre major, is one of 75 dancers who auditioned for a spot in the dance ensemble for the Musical Theatre Intensive. The dancers had just four rehearsals to learn the “42nd Street” Broadway Revival tap choreography before their Thursday night performance. 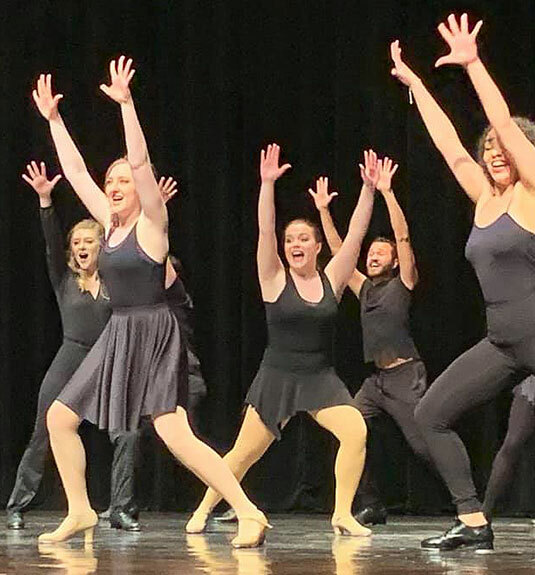 Peters, who is minoring in dance at MBU, said the auditions were intimidating because all the dancers were talented and strong performers, but the next day she was cast in the cabaret performance and given a spot in the front row of dancers. Peters also said she appreciated the experience of working with seasoned professionals. She said it was valuable to make connections with students across the region who are on the same path as she is, and she’s excited to see how those connections help her when she enters the world of professional theatre alongside these other students in a few years. This conference is an opportunity for students to apply the skills they are learning at MBU, learn from other professionals about new subjects and interact with theatre professionals from across the region. 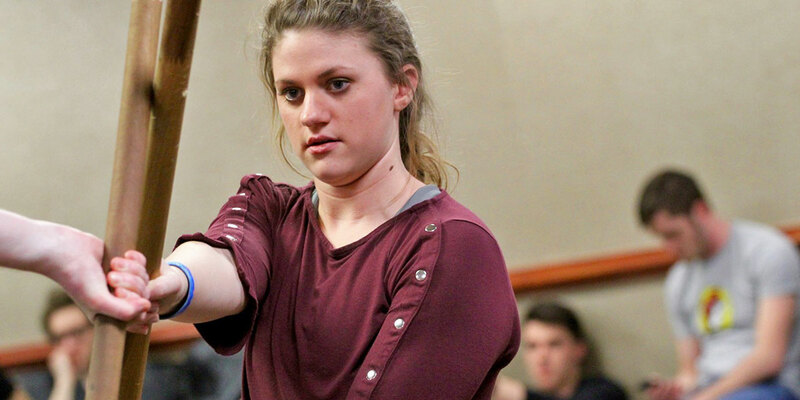 Steele, a senior theatre major, said the process of choosing material to use for her Irene Ryan audition involved many considerations: which acting style she enjoyed and excelled at, whether to include Shakespearean pieces and also her scene partner’s strengths. The next step was to cut down the scenes to fit the precise time limits required in the competition. “I had to contact one of the playwrights and ask for permission and then I had to scan the scenes and monologues to make them short enough to fit within the time limit while still maintaining the integrity of the scene and the playwright’s intent,” Steele said. As well as helping students prepare for auditions and guiding the group through registrations and ceremonies, MBU Theatre faculty contributed knowledge and experience to the festival by leading workshops and panels. Robb presented three workshops at the festival, including an interactive workshop on neutral masks that had over 80 participants. Kasey Cox, director of theatre, assistant professor of theatre and director of In Charactre, also led a panel at the conference on how to have a career in theatre while parenting. Students had the opportunity to learn from professionals across the region through workshops and intensives teaching a plethora of skills, such as stage combat, ballet, directing, script writing, audition psychology, interpreting Shakespeare, acting for the camera and various acting techniques. Left to right, back row: Cameron Tyler, Hayden Bennett, Rebekah Side, Daniel Dilworth and Rachel Yarbrough. Left to right, center row: Alle Head, Kristianna Pirrie, Lindsey Peters, Alicia Neal, Whitney Weber and Eliana Steele. Left to right, bottom row: Jon Ellison, Nathanael Pezzo and Tyler Gruen.